Support future installments of This is Not a Conspiracy Theory with your series purchase. Episodes are delivered in installments, on a slow and erratic – but loving – schedule. Episode One is free to watch, and if you enjoy it, you can purchase the full series for $14.99 (or more!). The complete series will be edited into an eighty minute feature documentary. You'll get each of the episodes as completed. Watch anytime, anywhere, forever. As a member, you also get opportunities to interact with and influence the production. And occasionally we come up with unique perks. Limited Edition Poster Clearance Sale! Another great way to support the production: order a limited edition poster. 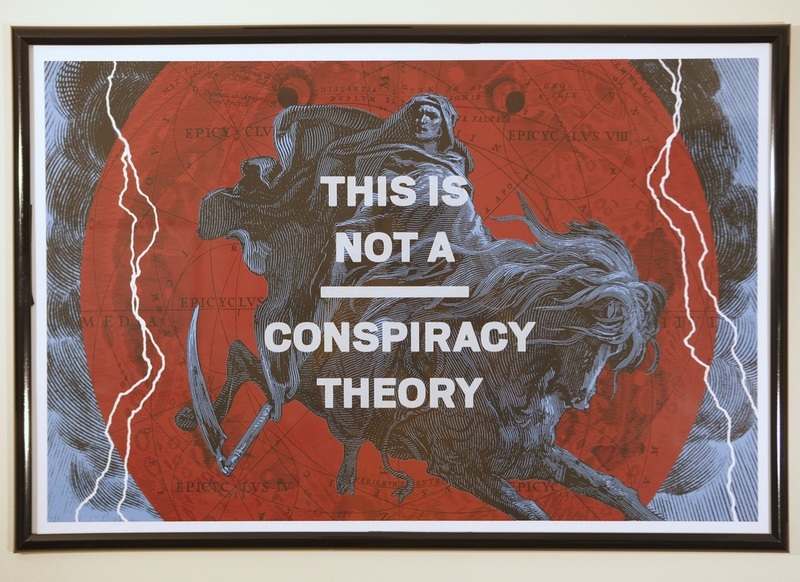 "This is Not a Conspiracy Theory"
Includes a coupon for a free digital download of the series. 24" x 36" , 3 color, screenprint on 100 lb. stock with archival ink. Limited edition of 150 prints. 18 posters remaining. 6 - 8 weeks for international . Occasional news from This is Not a Conspiracy Theory and series creator, Kirby Ferguson. Less than six emails per year. We will never sell your address or send you spam. Thank you! Almost done: check your email to confirm your subscription.